One Way Van Hire To Spain - What Is The Cost Of Hiring A Van For Your Spanish Move? One way van hire to Spain can often seem like a cost effective alternative to hiring a specialist removals company. However, there are many problems and pitfalls that are associated with doing exactly this – when everything is added together, it may not be that cheap after all. There are so many things to consider when hiring a van to take your removals to Spain. This includes the van itself. What size will you need? Hiring a van that is too big is wasted money, but a van that is too small is potentially worse, as you will either have to pay to store some of your items, or make two trips. This will, of course, double your initial costs. If you do need to keep the van for an additional trip, that may not be possible – it could already be hired to the next person who will be waiting for it in Spain. You would then need to hire a van yourself to drive back, and van hire Spain can also be difficult. In this situation, it is often better to hire a van that is definitely going to be too large for your needs. It may sound strange, but at least you would only need to do one trip, and wouldn’t have any problems at the other end. Of course, it will be more expensive. 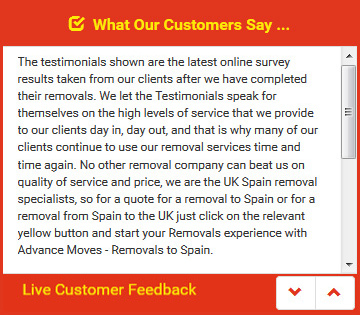 In many situations, those who are considering hiring a van and self-driving to Spain from the UK find that it is cheaper to go with a removals firm who provide expert drivers. One way van hire to Spain is a great idea, provided you choose a removals company to drive and pack for you. Otherwise, it can be expensive and fraught with difficulties. Advance Moves offers this excellent service amongst many others. See our website for more: http://www.advancemoves.com/. When you are ready for costings, please call or email info@advancemoves.com.